It's Wednesday again! That means I have another scrapbook page to show you. I'm still busy playing around with My Digital Studio. It's so much fun to put a page togehter and play around with it and have it done in such a short time. 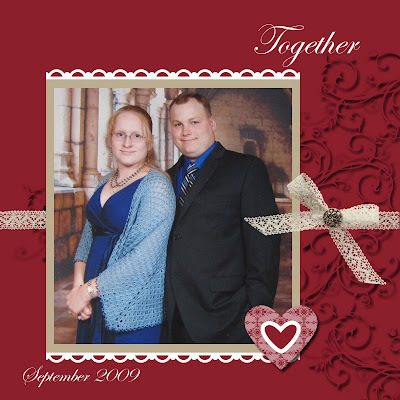 I definitely think I will do more scrapbooking with My Digital Studio than I have with traditional scrapbooking. You can't tell my mind is on the upcoming cruise vacation can you? This is another photograph taken from the Disney Cruise Vacation my family went on last fall. This photo is the one taken on the formal dinner night of me and my husband. The background paper is Cherry Cobbler cardstock. I then added several images of the Baroque Motifs swirls and added a shadow with 80% opacity. Then I changed the color of the stamped image to Cherry Cobbler. This gives a tone-on-tone effect that looks subtle and very nice. I added the Crochet Trim to the center of the page. The photo was added with a larger than standard mat (I can't remember the size number I used). The Scalloped Trim Border Punch was added in Very Vanilla to the top and bottom of the photo mat. The Crochet Trim Bow was added at an angle just so it overlaps the photograph a bit. An antique brad was placed in the center of the bow. The stamped image from Together Forever was stamped in Very Vanilla in the upper right hand corner and the month and year was added in a text box. It really is super easy to create a page using this program. If you want to learn more about My Digital Studio feel free to ask or you can take a look at more information here.